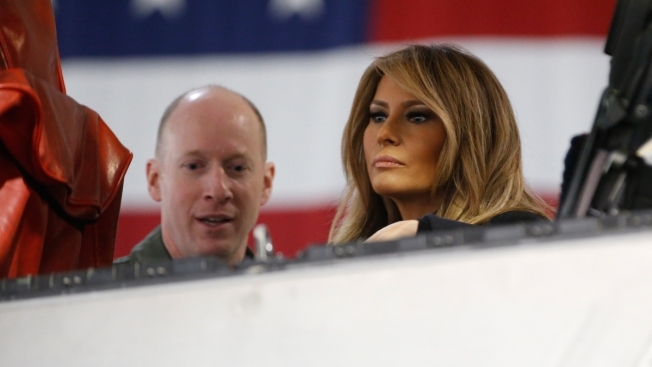 First Lady Melania Trump, right, talks with Col. Jason Hinds, Commander of the First Fighter Wing as he shows her the cockpit of an F22 fighter at Joint Base Langley in Hampton, Va., Wednesday, Dec. 12, 2018. First lady Melania Trump said that the most difficult part of her time in the White House is watching "opportunists" use her family's name to advance their careers, claiming they're not recording history properly, NBC News reported. "I would say the opportunists who are using my name or my family's names to advance themselves, from comedians to journalists, to performers, bookwriters," she said in an interview with Fox News host Sean Hannity which aired Wednesday. "The problem is they are writing the history and it's not correct." In the interview, Trump also said that sometimes she doesn't agree with her husband's tone "and I tell him that."